UPDATE: BOMB SENT TO CNN, Maxine Waters! – Bomb packages sent to Hillary Clinton, Obama! It’s just being reported that suspicious packages were sent to the homes of both Hillary Clinton and former President Obama. U.S. Secret Service: Late on October 23, the Secret Service recovered a package addressed to Hillary Clinton in Westchester County, NY. 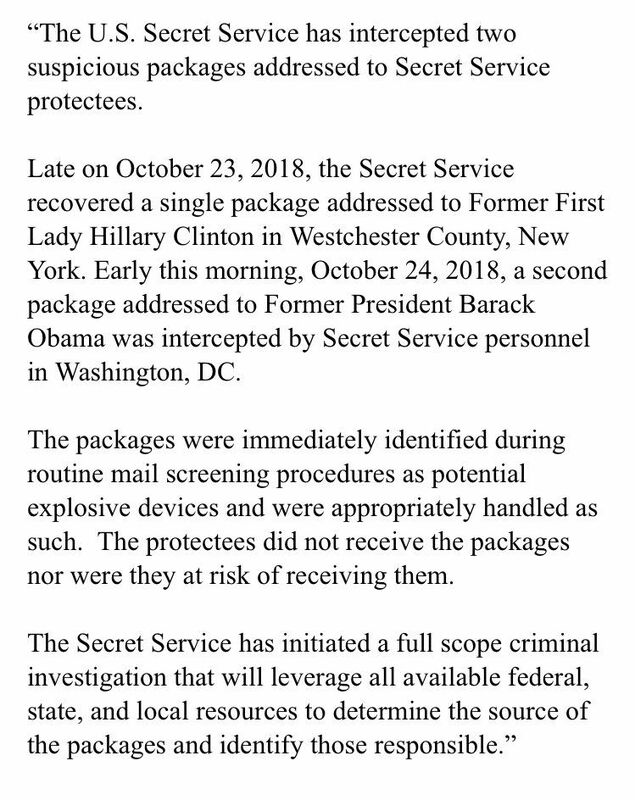 Early this morning, a second package addressed to Barack Obama was intercepted in DC. Both were handled as potentially explosive devices. This just a day or so after someone put a similar explosive device in the mailbox of George Soros, which was detonated by police. NYPD says they investigating a suspicious package at the Time Warner Center at Columbus Circle. Several CNN employees say they are currently evacuating the building. CNN just walked back its report that a suspicious package was sent to the White House, too. So far, only Soros, Clinton, Obama, CNN. That doesn’t quite seem right to me – it looks more like the shiny reflection of the tape. If you look at the other parts where there is black tape, it has the same sort of effect. Also why would ISIS just target the media and Democrats when they’re ones who look the other way on terror attacks? Anyway, I wanted to let you all know this theory is floating out on Twitter, which is terrible, and also I’m addicted to it. The end. So it turns out Andrew Cuomo was full of it when he said he was targeted as well. Just jumping onto the victim bandwagon. BREAKING: A suspicious package addressed to Rep. Maxine Waters was intercepted at a Capitol Heights processing facility that handles mail going to the Capitol, according to 3 congressional leadership sources. The package was addressed to her office but never made it that far. A Dem aide confirms to BuzzFeed News a package addressed to Maxine Waters was intercepted at a Congressional mail facility.